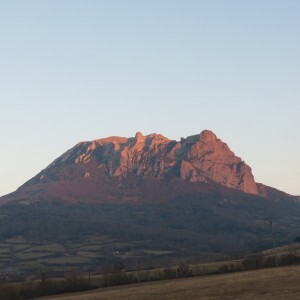 Pic De Bugarach is both an energetic and geological phenomenon. Geologists say Bugarach is a mountain built upside down. Thousands of years ago when the formations of the Pyrenees Mountains were arising out from the earth one particular peak arose and was toppled over in this cataclysmic transition. Still today Pic De Bugarach stands differently than the other foothill mountains of the area as if it is a separate entity altogether from the Pyrenees. It does not have a typical pointed top but appears as if the peak has been broken off, standing separate from other ranges of mountains with its atypical shape. From an energetic perspective Pic De Bugarach is one of the special power centers of the world holding a dynamic presence for the planet. This relatively small mountain, standing less than 4,000 feet above sea level and a two and a half hour walk to the top from its base, is a Stargate. A conduit for energies (and possibly life-forms) from other dimensions and realities to pass into the earth, as well as move out from a deep source within the planet. Those with extra sensory abilities, perceive an invisible cloud like formation directly above the small dome shape peak, it is the entry point into something beyond the human/earth experience, something at such a higher vibration few humans can comprehend all of what it is. I for one feel I can only get a glimpse of its potency, yet a knowing inside tells me there is much more. What higher vibration is required for beings of various forms, from spaces ships, etherical galactic travelers to enter from other dimensions into this earth plane? No one is for certain, we can only speculate it is an awareness exponentially more evolved than humanity. However, its presence affects us in expansive ways when in its presence. A stream of higher vibrations seems to flow from directly above to the dome shaped peak, into the mountain to follow a path deep within the earth to a place of equal potency. There is a direct interchange of flows of consciousness from the inner earth to the skies or heavens with a traffic of beings moving through. In my experience we humans with extra sensory abilities only perceive a glimpse of what is actually happening. It appears Pic De Bugarach was designed through the thousands of years for this very function as it has an energetic presence (most likely due to the Stargate) with lay lines streaming out in a variety of directions. The early places of worship were built on the lay lines and later Caatholic Churches and Chateaus constructed their temples on the same spots. In my experience as I walk up the mountain paths to the top the chakras are stimulated, beginning in the heart at Bugarach’s base, then in the top half the second chakra and when on the upper levels the thymus. Part of the thymus gland’s function is the development of psychic abilities. When we are on the top plateau area a lighter vibration exists, I see it as a light blue color, similar to the dome at Rennes Le Chateau. Then at the top of the dome, mountain peak a light stream of energy is coming out. There is a wide variety of responses with people, some experience similar empowered sensations while others feel less. From an intuitive’s point of view of perceiving into the Pic De Bugarach there appears to be energy centers, similar to the concept of humans having chakras. There is large energy center at the base of the peak as the heart, a center near the top similar to second chakra energy. Then there are smaller energetic centers from the base going down into the earth. Somewhere below the vertical pathway of power spots is a reality similar to the Stargate at the top of the peak. In between the heart and second chakra of the mountain, at the center on this energy lines in another energy center called the “Two Suns”. The energies of the Stargate above the mountain and inner dimensional reality within the earth meet. When perceiving into the mountain in this space a small presence of a sun exists. Strangely photos have on rare occasions show an image as if small beams of light are coming out of the mountain in this location as if a light contained in the mountain is beaming out in a few small rays. This seems to be one of the major power centers of the mountain. What is the point of learning this energetic anatomy? To access these energies into our body to enhance our own development. A visit to Pic De Bugarach should include a large amount of time activating, inviting and meditating on these energies so we learn their vibrations, we then can integrate them into us. We advance our own evolution at a faster pace when we practice expanding with this great teacher of higher vibrations, Pic De Bugarach.